BRIC-Link II is a low-cost, high-performance solution for audio-to-IP conversion. Like its predecessor BRIC-Link, BRIC-Link II provides an elegant way of moving linear or compressed audio with very low delay. BRIC-Link II is simple to use, and can be deployed over a wide range of IP links. While it carries an entry level cost, BRIC-Link II maintains superb audio specifications and hardware reliability, making the system perfect for studio-to-transmitter links (STLs) and other mission-critical applications. 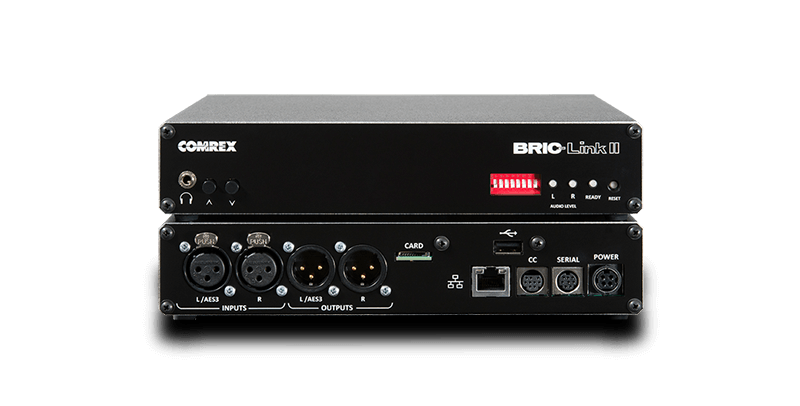 BRIC-Link II is a true codec, offering a full-duplex stereo encoder and decoder in each box. A jitter buffer manager is incorporated that automatically balances delay and stability, dynamically increasing and decreasing delay based on network performance. End to end coding delay in linear modes is less than 25mS and FLAC modes are less than 30mS. For users concerned about delay and coding artifacts, BRIC-Link II offers a robust stereo or mono linear mode that does not compress audio. BRIC-Link II is also the only real-time audio codec to offer FLAC lossless compression. Additionally, BRIC-Link II offers AAC/HE-AAC modes as standard, along with Opus, and VoIP standards G.722 and G.711. Quite simply the most advanced network management tool on the market today. When used in “bonding” mode, CrossLock gives users the ability to manage and bond multiple data connections together simultaneously. When a new network is introduced, CrossLock will immediately evaluate how much bandwidth is available, while factoring in latency and jitter information, and combine the two connections to take advantage of all available bandwidth. In Redundant mode, all data will be sent over all networks. CrossLock can also monitor each data connection individually and, when necessary, apply appropriate error correction, recovery, or concealment techniques. HotSwap allows users to back up studio-to-transmitter links (STL) or other dedicated links with a wireless modem. HotSwap lets users select a network that will only be engaged if the primary network fails. The system will warn of this status with a contact closure, and automatically fallback to the primary once it’s restored. Fall-over to backup happens in a matter of seconds, and fallback is seamless. For BRIC-Link II, only Comrex Connect Modems are supported. 4G LTE Comrex Connect Modems are available for purchase through any Comrex dealer. When ordering, ask for the NX model of Connect Modem. Verizon, AT&T, and International versions are available. HotSwap is included in firmware version 4.3, which is available now. BRIC-Link II acts as a web interface, allowing the user to access all controls through an intuitive web interface. The page displays connection status, extensive network diagnostics, and audio level meters for remote monitoring. From any location, users are able to configure profiles for various connections with point-and-click connection commands. Codec Commander provides the same control capability as the existing web interface, but doesn’t use Adobe Flash, making it a good alternative for users who are concerned about frequent updates and security risks. Codec Commander is a Microsoft Windows™ application you can use to control your audio codec. You can manage your connections, check statistics, view audio metering, adjust audio profiles or change system settings. BRIC-Link II can function as a streaming server, delivering multiple streams to computer based media players that support HE-AAC – up to 40 streams over a T1 Internet connection at once. BRIC-Link II also offers the ability to act as a source feed for both SHOUTcast and Icecast servers – with a single BRIC-Link II, you can expand your radio presence to the Internet without the need for a dedicated PC. Both BRIC-Link II and BRIC-Link are compatible with smartphone applications, including Linphone and Luci Live. Connect to your codec from your smartphone quickly and easily for easy drop-ins and spontaneous remotes. They are also compatible with FieldTap. A free application for iOS and Android, FieldTap makes it simple to connect with the touch of a button. Plus, FieldTap is compatible with all other Comrex IP audio codecs. Comrex Switchboard Traversal Server was created to make it easy to make connections between Comrex IP codecs. This is especially important when broadcasting over networks that have firewalls and routers and other IT snags. Switchboard allows your codec to sync with a cloud-based server, making it possible to connect without having to know the IP addresses on either end of the link. Switchboard saves all the details of the codecs subscribed to the server. This means that when it’s time to connect, you don’t have to enter any information – you can simply choose the codec you want to connect to from a menu, and hit a button. Switchboard is available for BRIC-Link and BRIC-Link II codecs through the one-time purchase of a license key per codec. 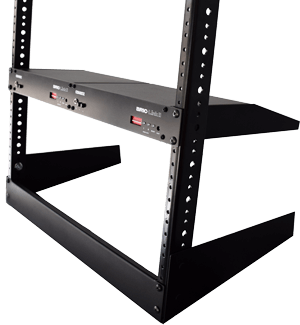 Mount a single or two side-by-side BRIC-Link IIs in your 19″ rack. *BRIC-Link II Rack Kit includes: Rack shelf, customized front panel and mounting screws. Fleet Commander is a software application for controlling multiple Comrex IP audio codecs simultaneously. Rather than logging into each codec individually and juggling a desktop full of tabs, Fleet Commander puts you in control of your codec fleet through one unified interface. With the ability to manage all codecs from one simple window, this easy-to-use tool can save time and increase productivity for busy engineers. Fleet Commander contains all of the functionality of the Web-based Interface, but also comes with a few more features like active metering and the ability to copy peers and profiles between codecs. A Windows application, Fleet Commander can be used to manage every Comrex IP Audio codec in your fleet (depending on CPU and network limitations). 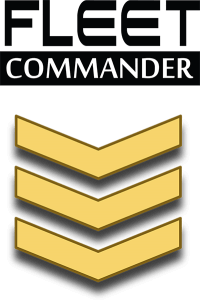 Fleet Commander is available as a one-time purchase of a license key per computer.